John Quincy Adams was the 6th President of the United States of America, the symbolic leader of the country. His presidency began in 1825 and ended in 1829. He was 57 years old when he first began his term of office on March 4, 1825. John Quincy Adams was the son of John Adams, the 2nd US President. He was named after his great-grandfather 'Colonel John Quincy' who was the Speaker of the Massachusetts Assembly. He had a variety of nicknames including The Abolitionist, Publicola, JQA, Old Man Eloquent and the Madman of Massachusetts. Several of his nicknames referred to his campaign against slavery and his persistence in bringing up the slavery issue against the rules of Congress. The picture of John Quincy Adams portrays an interesting image of what this famous man looked like. The picture shows the clothing and the hairstyle that was fashionable during his presidency. He is described as being 5 feet 7 inches in height and weighed about 175 pounds. He had brown hair that grayed as he grew older, he also lost much of his hair as he aged. He sported side whiskers but his face was dominated by his piercing eyes. 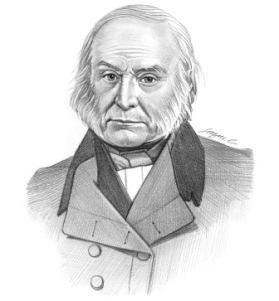 Character & Personality Traits: What was John Quincy Adams like? The personality of John Quincy Adams is described in his own words as "I am a man of reserved, cold, austere and forbidding manners, my political adversaries say, a gloomy misanthropist, and my personal enemies, an unsocial savage". He clearly had a poor opinion of himself but despite his perceived faults he was a determined man who had the ability to obtain exactly what he wanted. He was aware of his appearance and always took care to dress in plain but expensive fashionable clothes. The important role and duties of the President of the United States of America include those of Chief of State, Chief Diplomat, Chief Executive, Commander in Chief, Legislative Leader and Leader of his own political party. What was John Quincy Adams famous for? Why was John Quincy Adams important? The history and life of President John Quincy Adams during his presidency is conveyed in the following fact file in an easy question and answer format. What President was John Quincy Adams? He was the 6th President of the United States of America. The dates of his presidency began in 1825 and ended in 1829 (March 4, 1825 to March 3, 1829). What other political offices did John Quincy Adams hold before his presidency? Who was John Quincy Adams' s first lady? John Quincy Adams was famous for the events and accomplishments of his presidency, but what are the facts about the man and his private life. Facts and information about the private life of John Quincy Adams can be found in the following fact file in an easy question and answer format. When and where was John Quincy Adams born? Where was John Quincy Adams educated and what was his religion? What did John Quincy Adams do before he became President of the United States? Who was John Quincy Adams' wife and when did they marry? Did they have kids? He died on February 23, 1848, in Washington, D.C.
We hope that the picture, facts and information on President John Quincy Adams will prove helpful to kids, school children and schools learning about the presidency of this famous American leader. The facts about John Quincy Adams provides an overview of the President's character and personality traits. Watch the video and learn more about the major events of his life and his accomplishments. The following John Quincy Adams video is a useful educational resource for kids, children and schools learning about the life of the US President John Quincy Adams.